But then I randomly bought some ground turkey at the grocery store the other week, and needed to use it up. I realized that everything I would normally do with ground meat is tomato-centric (chili, pasta sauce), and I’m trying to avoid tomatoes. So I was about to just freeze it and use it up later, when I stumbled across this recipe. I think the raisins and cous cous won me over—it actually sounded pretty good, and I decided to give it a try. Well, I’m not going to say that I’m a total meatloaf convert, but this was definitely very good, and one of the easiest recipes I’ve ever made. The spices work well with the turkey, and I love the raisins in it. The only thing I would probably change next time is to use a different, bigger grain. I think the cous cous added to the whole “weird texture” problem I have with meatloaf (also not helped by using ground turkey, which I find inherently weird). I would try using a bigger grain, but pre-cooked. Other than that, this was an awesome recipe that I will probably use again! Note: Recipe below is how I made it, without accompanying sauce. Follow link for sauce instructions! Put water on to boil. Preheat oven to 425 degrees F. Roughly chop the onion, and combine in a bowl with the raisins, cous cous, salt, curry powder, and cinnamon. Pour in 3/4 cup boiling water and cover for two minutes. And the turkey and beaten egg, and mix well. Pour into foil-lined and greased (or just greased) loaf tin or 8×8 pan. Bake in the top third of the oven for 20-25 minutes, until baked through and no longer pink. Makes about 6 servings. This recipe comes from Aarti Party on the Food Network- she was the winner of The Next Food Network Star over the summer, and is basically my food idol. From the first episode of Food Network Star you could tell she had an extremely camera-ready, bubbly personality, and, just as importantly, knew how to cook some seriously good food. Her show focuses on Indian flavors that can be used in everyday dishes- she injects Indian flavors and spices into many different dishes. While Indian food can seem intimidating, Aarti takes the fear factor out of it, and doesn’t only do complicated curries and masalas (although I love both of these things, and hopefully she will showcase some more classic Indian recipes on this season of her show), but salads, stews, and simple appetizers inspired by Indian flavors. The turkey mixture. It is totally ok to spill some over the side of the pan. This chili-type stew was on the first episode of Aarti Party, and I had been looking to start experimenting with Indian food and this seemed like a good place to start. 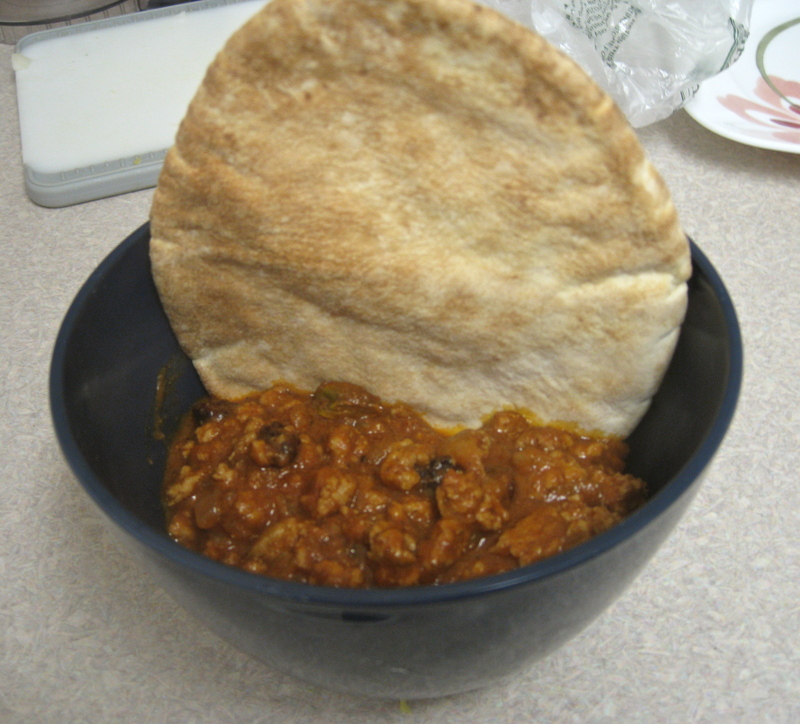 She makes this as a kind of sloppy joe with buns, calling it Bombay Sloppy Joes, but I forgo the buns and eat it as a chili with pita bread or on top of a baked potato. I’ve made some modifications to the recipe to use a couple less ingredients, and I do usually add the half-and-half at the end, but don’t feel it’s totally necessary. Buying spices for dishes like this can be expensive at first, but they really do last a long time, and you can put them into so many different things. A lot of the spices used in this dish are also staples for basic hummus recipes, and add extra warmth and flavor to certain soups or stews, even if they are not at all “Indian”. If you think you don’t like Indian food, please try this sometime- I promise it’s not overwhelmingly spicy, and makes a great lunch or dinner. Make the sauce first, warm the oil in a saucepan over medium heat until it shimmers. Then add the ginger, garlic, and serrano pepper. Saute until the ginger and garlic brown a bit, then add the garam masala and paprika and saute for about 30 seconds. Stir in the tomato sauce and water, bring to a boil, then reduce to a simmer and let simmer for about 15 minutes, until thickened. For the turkey, if using the raisins and pistachios, warm 2 tablespoons of oil in a skillet, add the pistachios and raisins and cook until the raisins swell up and pistachios are slightly toasted (only a couple of minutes). Remove from the pan and set aside. Heat 1-2 more tablespoons of oil, then add the cumin and saute for about 10 seconds. 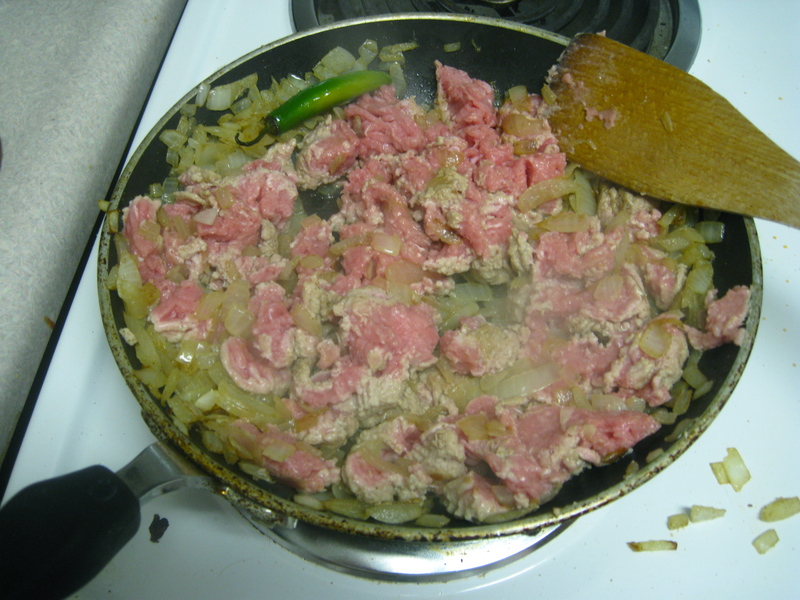 Add the onion and saute until softened, about 5 minutes. Add the serrano pepper and saute a couple more minutes, seasoning with a little salt. Stir in the turkey, breaking up the big lumps with a spoon, and cook until opaque- about 5 minutes. By now the sauce should be ready- pour the sauce into the skillet with the turkey. Stir and bring to a boil, the lower the heat and simmer about 10 minutes. When turkey is cooked and sauce is thickened, add the pistachios and raisins back to the pan, with the honey and half and half. Remove the serrano pepper and taste for seasoning. Serve with warm pita bread or naan, or on top of cous cous, baked potato, etc.